I watched the Timbers go down 2 – 0 in the first half Wednesday night against FC Dallas before leaving disgusted for my indoor game. At halftime of my game, I noticed that Portland had come back to tie. Two common occurrences for the Timbers this year have been comebacks and ties, so perhaps it shouldn’t have been that surprising. The Timbers have played nearly 400 minutes this season from behind–a quarter of their time spent on the field–which has given them plenty of time to win back the home crowd after early goals conceded. In all that time spent losing (nearly four game’s worth) Portland has outscored its opponents 13-to-4. That’s like four straight 3 – 1 wins. Even though most teams perform better when playing from behind, that still ranks Portland second in the league behind Vancouver (see chart below). But wait! Hold the bus. There is one major confounding factor that we can control for here. Home field advantage. The Timbers have oddly found themselves frequently facing deficits at home, which means that a large portion of their time spent losing is spent in the friendly confines of Providence Park in downtown Portland. In fact, the Timbers lead the league in minutes spent losing at home–a weird stat, to be sure. Here’s the same chart, but for teams losing at home. Even when I control for home field advantage, we still see the Timbers among the best teams at playing from behind, averaging 2.1 more goals than their opponents per 96 minutes. Is it the coaching? The players’ mentalities? The raucous home turf on West Burnside? Luck? I don’t know, but I know it’s happening. Another weekend, another bunch of ones and zeroes on the scoreboards for the games I checked out. The season’s a quarter done now for just about every team, and reality is starting to set in that playoffs are only going to be a dream for some this year. Still, MLS is a league of incredible parity and almost everyone still harbors dreams of the postseason, no matter how realistic they are at the moment. It’s nearly impossible to analyze this game without spending a bulk of your attentions on second half stoppage time, when both goals were scored. Not only that, but LA’s Juninho had a breakaway chance to put the game away and was bundled over with no foul called. All in all, it was a pretty incredible conclusion to a game that was fairly entertaining, if not particularly well-played. To some degree, it was more of the same for both teams: the Galaxy struggled to finish the chances they were able to create, and Portland looked out of sorts and a little slow compared to last year’s high-octane outfit. Anyway, this game seemed like a pretty decent case study with these two formations facing off with one another: Portland’s 4-3-3 against LA’s diamond midfield. It’s my opinion that the narrow diamond midfield does a great job of neutralizing what made the Timbers’ 4-3-3 so effective last year – that’s part of why RSL just seemed to have Caleb Porter’s number last year. Portland was at their best last year mainly because of two guys: Diego Chara and Will Johnson, who played as a double pivot and covered more ground than the Trans-Pacific Railroad. However, the Galaxy’s narrow midfield boxes that double pivot in with four central mids who are all tucked inside, limiting the number of balls Chara & Johnson can win and thereby limiting Portland’s possession. There are plenty of other reasons the Timbers haven’t been great so far this year, but it’s a trend worth watching as they try to turn their season around. It’s no secret that Columbus started out this season like gangbusters and have since played more like busts. The reason for this is inherently simple: they only have one way of playing. Every single game from Columbus is basically the same: they play the same guys in the same roles and try the same things. It caught teams by surprise in the first few games, but now that the opposition knows what’s coming (short passes out of the back, fullbacks getting way forward, etc.) it’s gotten a lot easier to beat. And now it’s up to coach Gregg Berhalter to make some adjustments and at least give the Crew a plan B so this losing skid doesn’t continue. Vancouver has sneakily been one of the surprise stories of the 2014 MLS season. Everyone knew they had a good deal of young talent on the squad, but nobody was sure how the chemistry would work out under first-year coach Carl Robinson. So far, returns have been impressive. Not only has Robinson set the team up in a position to be successful tactically, but he’s handed over a ton of responsibility to the youngsters to great effect. With veterans Kenny Miller gone and Nigel Reo-Coker perhaps on the way out, even more of the load is going to be heaped onto the 25-and-under players. During this victory, the only midfielder or forward in the starting eleven over 25 was Pedro Morales (28). And even when they made subs, they brought on 20-year-old Omar Salgado and 21-year-old Russell Teibert – I’d say the future is bright in Vancouver. It’s interesting that a lot of season previews of DC United focused on if the wide play would be good enough to get quality service for new striker Eddie Johnson. I say this because DC has been as good, if not better, as anyone could’ve hoped, despite the presence of roughly zero wide midfielders and zero Eddie Johnson goals. There are obviously a few reasons they’ve been so good, but chiefly among them is that this is Fabian Espindola’s team. He’s played better this season than I ever remember him looking in Salt Lake as the focal point of United’s attack, orchestrating everything and creating a lot of chances. 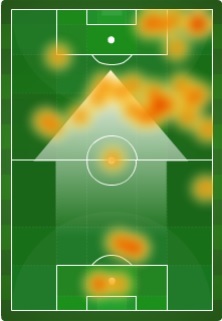 He does this by floating to the wide areas of the field to provide some width to DC’s narrow formation, as his heat map above shows (EJ’s actually pretty good at this too, particularly when holding the ball up). Philadelphia was everyone’s darling in the first few weeks of the season. All their new acquisitions looked really impressive, they had a young and improving defense and some talent up top that was sure to start banging in the goals soon. Fast forward a couple months, and the bottom has fallen out. This loss was their ninth game without a win, they’ve switched formations like four times hoping for a spark, and their coach might get fired soon. So what’s wrong? Lots of things. But #1 in my book is simply that the Union didn’t seem that interested in playing soccer against DC this weekend. I can’t tell you how many times I’ve seen Philly midfielders or defenders or really anyone just watch an opposing player run by them or pass the ball by them with little to no contesting. And this isn’t a problem for one or two players, it’s the entire team. Sorry to be such a rah-rah coach type who says they just need to try harder, but the Union need to be more active, or engaged, or try harder….whatever wording works best. I hate to be a disappointment, but Easter weekend means I only got to review two matches instead of the usual three. One was a doozy: a premier matchup of Western Conference powers, while the other had a pretty incredible final five minutes. On to the show (and if you’re really jonesing for some analysis of Chivas-Seattle from Saturday night, I’ll probably tweet some thoughts when I catch up on it later this week). We’re breaking new ground with this one: I’m combining both teams’ stats for this game. These two teams have had drastically different starts to the season, with RSL grinding out results against a very difficult schedule and Portland failing to do the same against an easier slate. Still, the margin of quality between these teams is pretty slim, and that fact was borne out this weekend. From a Real Salt Lake standpoint, this game was pretty much par for the course for 2014 and really the last five seasons. Aside from a few surprising miscues in possession that gifted chances to the Timbers, RSL’s diamond midfield was good in possession and solid in defense. They found a weakness in Portland’s defense by attacking the channel to the right of the Timbers’ centerbacks (that’s where all the incisive passes above, and Ned Grabavoy’s goal, came). Even though they weren’t at their clinical best, using tiki-taka passes to break through the backline, RSL did their job and got three points at home. As a Timbers fan, it’s yet another missed opportunity for Portland to get that elusive first win of the year. Theories of what’s plaguing the 2014 Timbers are abound, and like ghost stories or craft beers, I have my likes and dislikes. I’ll say two things on PTFC here: (1) their demise is overstated. Portland has hit the post like a million times already this year,* and the Timbers have only been outscored by four goals (coincidentally the number of penalties they’ve given up). 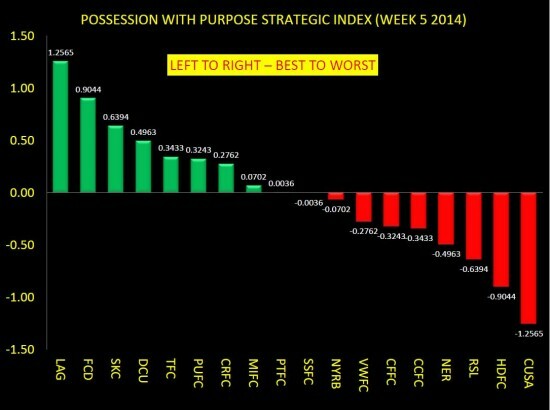 Once those two areas regress to the mean, it’s likely the Timbers will start to earn points and earn them fast. *Portland leads the league in posts and crossbars hit during even gamestates with four. 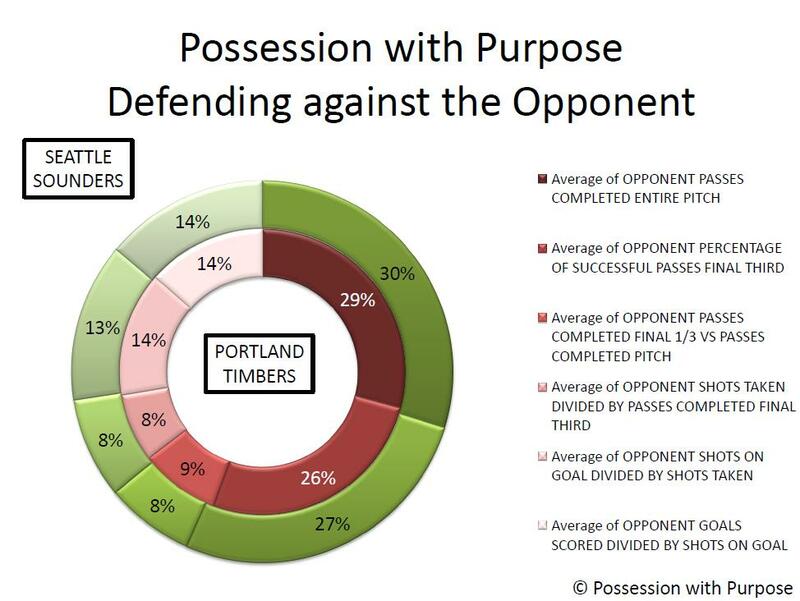 But that brings me to (2): the Timbers aren’t playing as well as they did for much of last season. 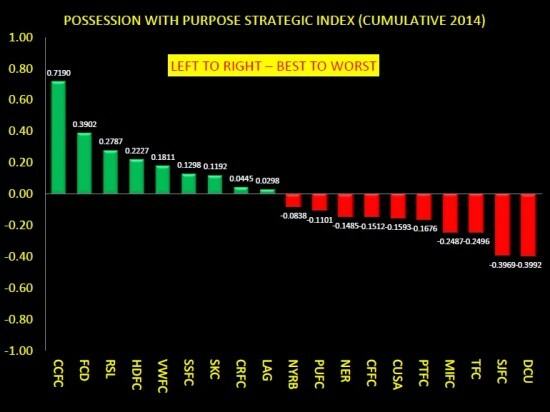 They are a team that thrives on possession when at their best, yet they’ve been out-possessed in each of their last five games. It’s like Portland is always flooring the engine, pushing the ball vertical to rush into shots instead of occasionally using cruise control and slowing the game down. A huge issue for them in this game was their lack of penetration in attack, as illustrated by the image above. Still, the game went back and forth with Portland and RSL both controlling the game for portions, and only the quality finish by Grabavoy instead of the fluffed chances by Maxi Urruti decided the result. That stat above makes no sense, so I’ll let someone much wiser than me explain. Bunbury has been playing up top for New England for the entirety of this season, and while he’s always been thought of as a striker, he fits better as a winger in the Revolution’s system. His speed is his greatest asset while his finishing leaves something to be desired, two sure signs that lone striker isn’t necessarily your best fit. At center forward in this one, Bunbury gave a lot of great effort and the team tried to set him off to the races behind Chicago’s backline. But it was never particularly successful. 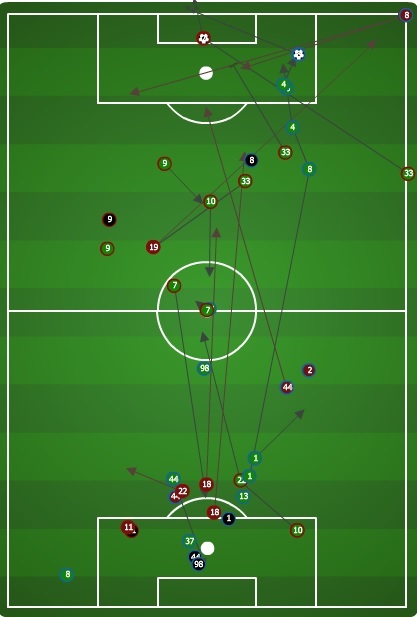 Late in the match, Bunbury was shifted out wide as Jerry Bengtson came on, and he promptly created a chance out of nothing by simply running really fast around Chicago’s left back. I’d love to see more of that and less of Bunbury struggling up top in the future for New England. Chicago played well enough to win this game, and probably should have. If not for a poor penalty kick in stoppage time that was easily saved by Bobby Shuttleworth, the Fire would’ve left with three points instead of yet another draw. The draws are getting to be ridiculous for Chicago (6 in 7 games! ), but they really have no one to blame but themselves. In addition to the penalty fiasco, the goal they gave up immediately followed one of those 11 turnovers by Chicago centerbacks. Patrick Nyarko was the one who gave up the penalty, but Soumare and Hurtado deserve at least a share of the blame. This was hardly an isolated incident for Chicago – their centerbacks have been shaky all season. Think they regret trading away Austin Berry right about now? With just four weeks of play in the books, it’s unlikely that the bottom feeders by the end of this year are those at the bottom right now. 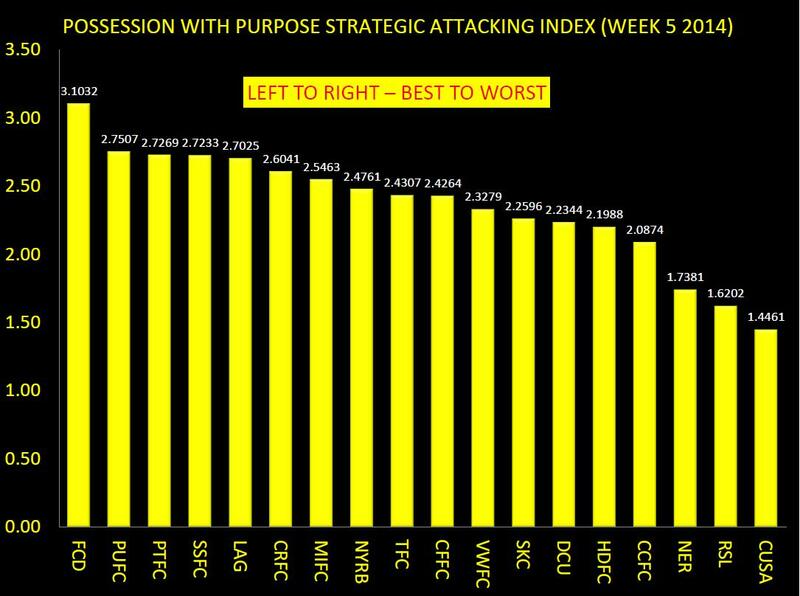 But this analysis should be an indicator on who needs to get better in attacking (and in defending) when it comes to Possession, Passing Accuracy, Penetration, Creation of Goal Scoring Opportunities and converting those opportunities into goals. As a reminder here is the initial PWP article offering up an introduction and explanation to the PWP Strategic Index, if this is a new approach for you to consider. For the future – please get used to the abbreviation and hashtag #PWP-TPI. I will refer to my cumulative analyses on MLS team performance this way. And in case you missed it here is a link to the Week 4 PWP Analysis. For me it’s no surprise that Columbus remain atop considering they have 9 points after three games and have done pretty well in all phases of PWP. They rank 3rd in Possession percentage at ~57%, 1st in Passing Accuracy at ~81%, nearly half of all their shots taken have been on goal (41.48%), and they’ve converted 62.86% of those targeted shots into goals. Only FC Dallas has a better rate in converting targeted shots on goal to goals scored (71.25%)… Conversely, DC United have only converted 7.41% of their shots on goal into goals scored. What is somewhat surprising is how far down Toronto have dropped after their 3-nil loss to Real Salt Lake. 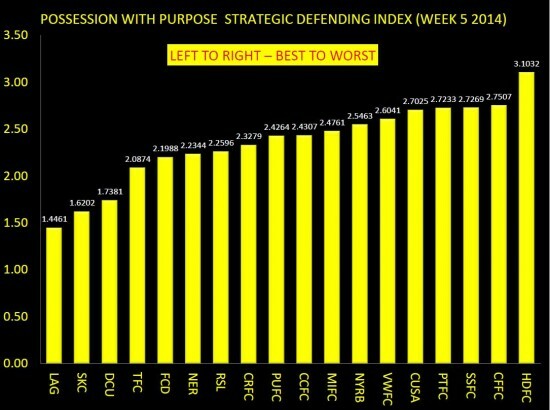 As noted in my Week 4 Analysis Toronto did well in getting results their first two games, but when going up against a traditional powerhouse in MLS their tactics and strategies were simply dominated. Again, to drive home some points about PWP – Passing Accuracy and Possession Percentage will influence the bottom line, and in the first three games Toronto have simply been very poor in passing accuracy (67%, 59%, and 54%), and their highest amount of possession percentage came against RSL at 46%, while they had 38% against DC United and 32% against Seattle. We already know that DC United has not started with a bang–and given Seattle’s loss to Columbus–it isn’t quite so surprising after all. (Perhaps?) the league table position for Toronto is more a reflection of luck and good fortune than a comprehensive approach to attacking and defending with purpose? I’m not alone in ranking Toronto a bit further down the scale… Whoscored.com currently ranks Toronto as 11th. I also checked Squawka.com, but their data currently only go out to week 2 for team comparisons. So enough about Toronto. Dallas, Salt Lake, Houston and Vancouver round out the top 5. In considering those other four, the new kid on the block for me here is Vancouver. Why? 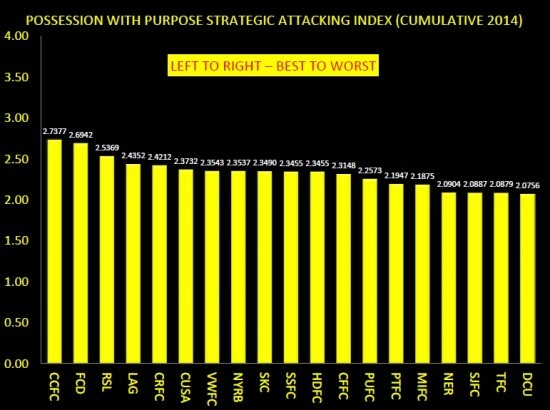 Well last year they had issues in defending while clearly having a very strong attack. Early indications are that the defending side of the equation has been fixed… does that hold true as the grind begins in April and the heat of summer sets in? As for Dallas, Salt Lake and Houston – Pareja is no stranger to fielding a top team in MLS when it comes to Possession with Purpose (Colorado was in the top ten last year), and Houston has done what it needed to do (at least so far) to get tighter in defense and offer up better balls for Barnes and Bruin to score. The boring team in the top 5 goes to Real Salt Lake. Simply said, they just keep doing what they need to do – polish their Diamond 4-4-2 and let it shine, regardless of who plays up top – be it Garcia, Plata or Saborio. Then there’s the ever present and dominating defensive central midfielder, Kyle Beckerman, who controls the back. Speaking of the Diamond 4-4-2 – as the year continues, I’ll be able to offer up additional analysis on what teams run what basic formations with the intent to really peel them back to see if specific team performance indicators increase or decrease based upon that simple filter. DC United – Aye – great weekend in that game against Chicago, and there remains no question DC United like a possession-based attack. 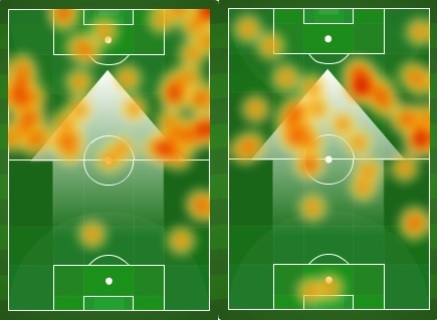 The difference this week was a highly engaged Johnson and Espindola in attack that also included a steady stream of pretty good crossing and wing penetration. How well that holds up is hard to tell. Head coach Frank Yallop has been known to cede possession, given his days in San Jose, but the direct attack for the Fire is more ground-based this year given the types of strikers. Has everybody by now realized that Yallop was sacked because he wanted to change the attacking approach in San Jose, and Watson–along with the front office–didn’t? To be sure – look no further than what team sits just above DC United – it’s San Jose. For now, that’s not an indicator that the Earthquakes are a bad team… no… I’d offer that it’s more of an indicator that their approach in attack needs refinement as does their back four being a bit unlucky with that own goal against New England. 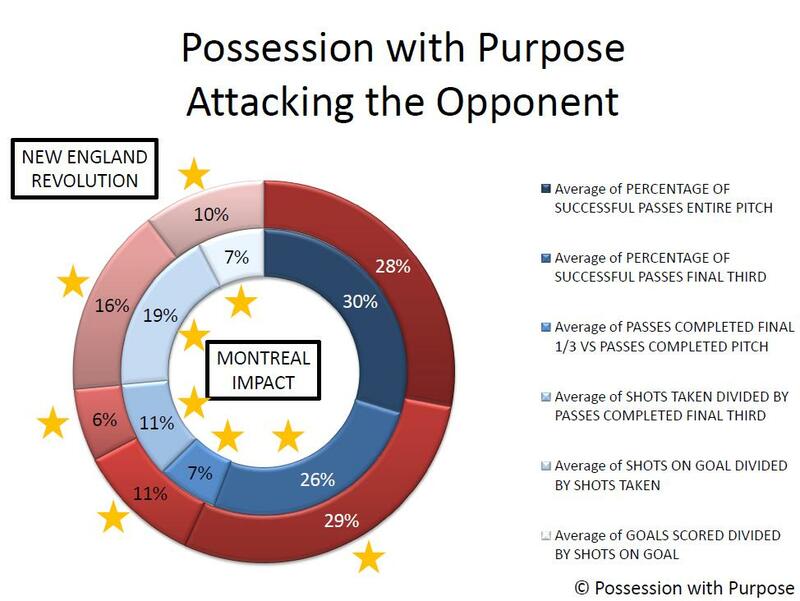 Not last and not least are Portland and Montreal… For me, seeing Montreal on the low end is not surprising – head coach Frank Klopas ran a pretty weak defensive team in Chicago last year, and it seems to have translated over to Montreal. It’s true that Di Vaio was missing in games 1 and 2, so this will be a team to watch as well. It’s early days and given some top activities in defending and attacking for Sporting it is likely their run of games inside and outside of the MLS Regular season will now give them a breather to prepare for Month 2; the same can probably be said for LA as well as the Earthquakes (who a lower at this time). As for New York – I’ll touch more on them in another article but for now I’m still not sure Petke has found the right mix. Philadelphia, from what I have seen, has some dangerous players in the Midfield (Edu and Maindana come to mind first) – so how they fare in April will be interesting to see in contrast with New England. 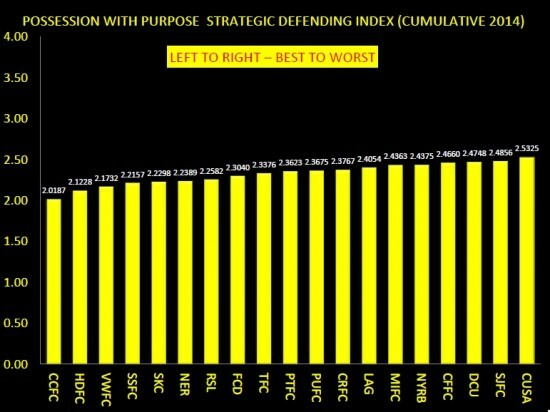 With all those observations I’ll simply offer up these two diagrams to give you an idea on where each team stands in the PWP Strategic Attacking Index and Strategic Defending Index. On to the Strategic Defending PWP and the PWP Defenders of March. Remember that the season is still young – but in about 4 weeks time it won’t be as young, and in 16 weeks time this Index should begin to settle in and hopefully, like last year, paint an early picture on who’s up for the Playoffs and who might be making some summer transfers to bolster chances for a late season push. Teams to watch in this Cumulative Index are numerous. In the bottom end let’s see about Toronto, Portland, San Jose, and DC United – will the rest of MLs figure out the way to beat the Toronto approach of counter attacking? Will the return of Donovan Ricketts after the Seattle match spell a recovery in the back four for Portland? Can DC United really make better use of the accuracy and possession based approach? And finally, can Watson continue to make use of his aerial attack in getting penetration through the air as other teams seem to build greater strength in the midfield? On the top side can Columbus continue their early run and does the sleeping giant residing in Houston awaken even more to clinch dominance across the East? Can FC Dallas hold it together this year under the new guidance of Pareja? How about the other money bag teams like New York, Seattle and LA Galaxy – have other teams in the mix figured a way to bypass the top-flight DP approach used by those guys or are they real challengers for the Cup and the Shield? Last but not least – the Champions from last year – Sporting continues to show well in defending, and Zusi has lifted his game on both sides of the pitch. Will the World Cup really be his time to shine? For the sake of the USMNT I hope so. As always my thanks to OPTA and the MLS for continuing to provide free information in order to conduct this analysis. 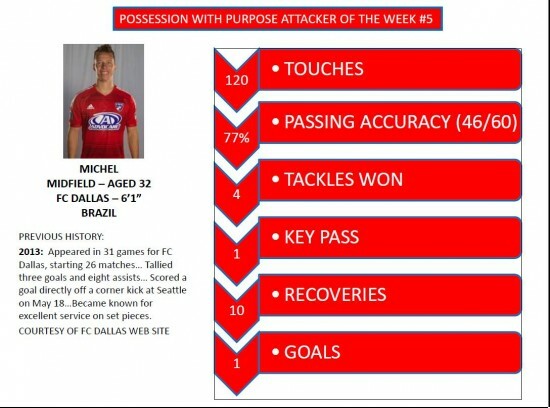 If interested here’s a link to my latest article on New Sports Hub about the Red Bulls of New York, including their PWP Attacking and Defending Players of the Week 4. You can follow me on twitter here: Each week I look to offer up twitter comments for the MLS nationally-televised games as well as those for the Timbers.